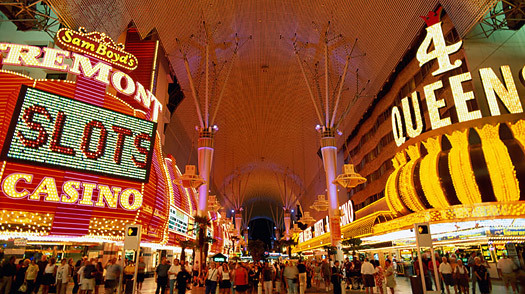 Downtown Las Vegas is the center of all the action in Las Vegas and offers a seemingly endless supply of things to do. We may seem a little biased since we do call this area our home, but with the recent growth and expansions, DTLV has become one of the cultural hubs for Las Vegas locals and tourists. We at Vegas Pub Crawler have put together this list of some of our favorite destinations and things to see in Downtown Las Vegas that you should check out on your next trip. Every summer, The Fremont Street Experience will host a variety of free shows and concerts. You can stop and enjoy the music and dance along right in the middle of the Fremont Street Experience. The DLV Events Center also hosts concerts throughout the year and offers many at no costs to get in. One thing you can count on when visiting DTLV are the many neon lights that surround the area. One of the biggest displays resides in the Fremont Street Experience. They offer a free light show that attracts over 17 million visitors each year. The 1,500-foot screen suspends above Fremont Street and features a variety of light shows that run every hour. Currently, two museums call DTLV home: Neon Museum and Mob Museum. The Neon Museum offers visitor to travel back in time to view retired neon signs that were once famous Las Vegas landmarks. Take a look back into the organized crime and law enforcement in Las Vegas at the Mob Museum. Learn about the Mob’s impact on The City of Las Vegas through bold and contemporary exhibits. Downtown Las Vegas has a vast number of activities and sights that can be hard to see in one trip. Tour the streets of Downtown Las Vegas and stop at the many watering holes along the way.